AutoCAD 3D Modeling Exercise Book. Self or classroom study workbook suitable for both inch and metric units. There are 8 lessons and 4 modeling projects. Each lesson starts with step-by-step instructions on how to create 3D solid models, followed by exercises designed for practicing the commands readers learned within that lesson. The modeling projects are designed so that users can create complex 3D models by combining many of the commands learned within the previous lessons. Downloadable sample files are provided to accompany some of the lessons and modeling projects, so readers can follow along and customize their creations to suit their own needs. 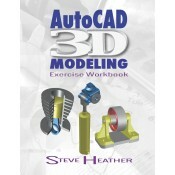 Written by Steve Heather, bestselling author and official Beta Tester of AutoCAD software, this is an invaluable resource for the thousands of designers, architects, and manufacturers who are using AutoCAD to create their own 3D models and transfer them to a 3D printer for manufacturing and use in the real world. If you want to learn more about cutting-edge 3D design, printing, and more using AutoCAD, the AutoCAD 3D Modeling Exercise Workbook is for you. Steve Heather is a former Lecturer of Mechanical Engineering and Computer Aided Design in England, UK. For the past 8 years, he has been a Beta Tester for Autodesk®, testing the latest AutoCAD® software. He is the co-author of the bestselling series of Beginning and Advanced AutoCAD® Exercise Workbooks. Previous to teaching, and for more than 30 years, Heather worked as a Precision Engineer in the aerospace and defense industries. â— Appendix B: Add a Printer/Plotter. 1 x Surviving the Spare Parts Crisis Sale! 1 x Value Creation Through Sustainable Manufacturing Sale!